Summer is finally here, and that means sunny beach days, impromptu picnics, and children anxious to get out of the house and into a pool. For me, that means I need to savor each small moment of relaxation while I can. Of course that means as much tea as possible. While I do drink cold brewed iced tea in the summer, I still enjoy many cups of it hot, even on the most humid of NYC days. I recently received beautifully packaged samples from Terrace Bloom, and the vibrant floral envelopes were calling to be (carefully) opened. I decided to try the Blooming Jasmine tea first, to go with the flower theme. The Terrace Bloom “Down to Earth Collection” utilizes handmade paper in it's beautiful packaging. Each parcel incorporates paper that is produced traditionally in Yunnan by people from the Dai Minority. 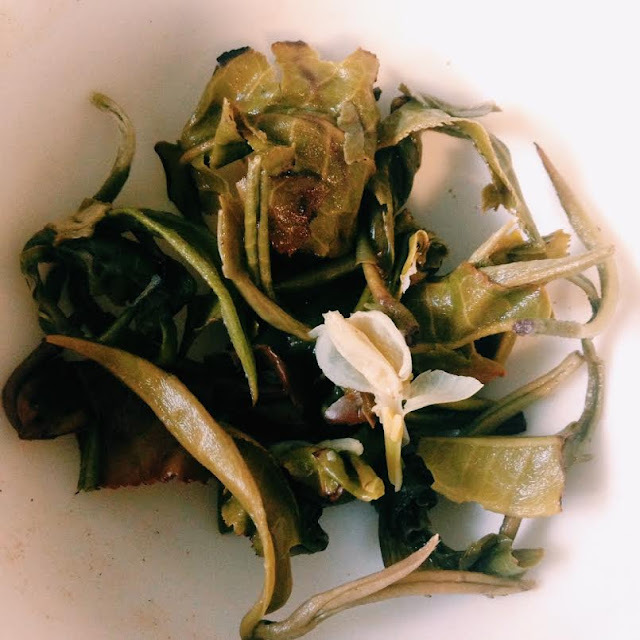 The dry green tea leaves are tightly rolled, with added dried jasmine flowers. The tea has a luscious jasmine aroma that masks most of the green tea scent. I wished the leaves weren't encased in the teabag, since their beauty can't truly be appreciated and there isn't enough room for the leaves to expand. I cut open the teabag and steeped the leaves loose. Really no reason not to. The tea has a delicate jasmine flavor. There is a slight astringency and bitterness, but steeping the tea a minute or so less would help with this. There is a gentle vegetal green tea flavor that reminded me of cooked snap peas. Sweet, green, a nice relaxing cup. It is floral, but not 'in your face' like many other jasmine teas I've tried. This would be a lovely iced tea as well. 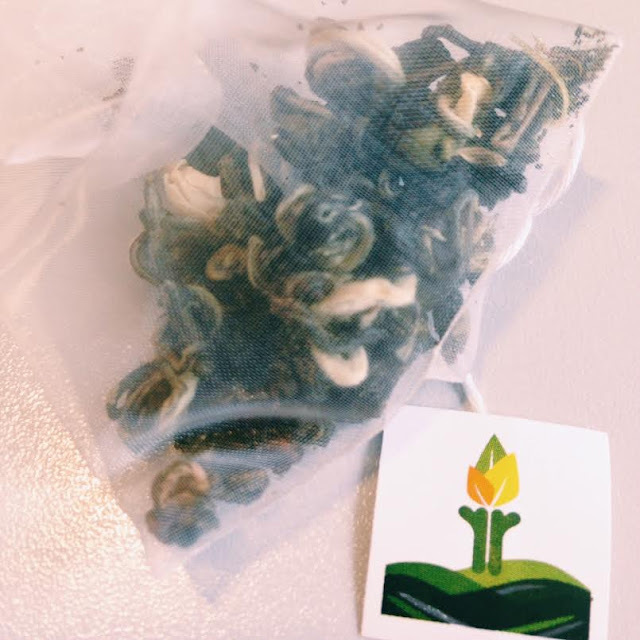 My recommendation would be to take this tea out of the bag, and enjoy watching the leaves unfurl. They can be steeped a few times this way. The Terrace Bloom website mentions all of their teas are grown on 'mountainside terraces' in Yunnan. The ingredients come from farmers in Yunnan but I wish there was more information about the specific farmers, and techniques used to create the teas. I would love to learn more. The company partners with ethnic minority groups in Yunnan to create everything from the tea to the packaging, which I found interesting. All Terrace Bloom teas and the paper used to package our Down To Earth Collection are produced by people belonging to the minority groups found in China’s Yunnan province. The specific people we partner with belong to the Hani, Bulang, Lahu, and Dai minorities. Thank you to Terrace Bloom for the samples!